KOL Advertising can help brands connect with China’s massive $261 billion USD outbound tourism market. But companies can do much more than offer free trips and merchandise to build working relationships with KOLs. KOL Advertising in China began as a small experiment a few years ago and has turned into a $8 billion industry. The tourism sector, in particular, has made a massive transformation from billboard-and-commercial advertising to using social media influence. Actress Yao Chen had 26 million Weibo fans when she got married in New Zealand in 2012. Her social media updates throughout the trip plus constant media coverage helped New Zealand attract 30% more Chinese tourists that year. Travel decisions are weightier than other consumer expenditures. The safety of a destination is a leading consideration for both free independent travelers (FITs) and package tour groups from China. The latter are particularly price-sensitive and value using their available time maximally. It’s easy to see how trust carries a premium when marketing to Chinese outbound tourists. Brands big and small should post about the KOL with whom they work. Not just a quick shout-out, but promotion across platforms that makes the KOL feel valued and gives them a larger footprint. Just as brands might view China-based, Chinese-speaking KOLs as a complex yet lucrative foreign frontier, so too are Western brands seen as an exciting new opportunity by Chinese KOLs. It’s true: Chinese travelers have clear preferences and expectations. However: The above statement can be very misleading. While plenty of studies have been done to grasp the nature of the Chinese tourist, it’s important to avoid generalizations. This group of 133 million people can be broken down into a myriad of cohorts by age, status, and interests. They all have very different wants and expectations. KOLs allow smaller groups with very particular desires to gravitate to content that reflects their personalities. Traditional outlets don’t come close in this regard. By working with a KOL for marketing in China, you get insight into specific groups from the individuals who understand them best. Start by asking what the KOL’s followers want and what travel services they’d like to see. Work with them to create new offerings that target markets other brands haven’t penetrated. Deeply insightful market research doesn’t need to cost a fortune if you have a strong relationship with a KOL. Chinese fans are more willing to be influenced by people they are familar with rather than brands themselves. When someone they consider to be genuine or a role model is doing the talking, chances are higher that they will be influenced. Here is the example of Janice 简妮, a renowned traveling blogger based in Shenzhen. 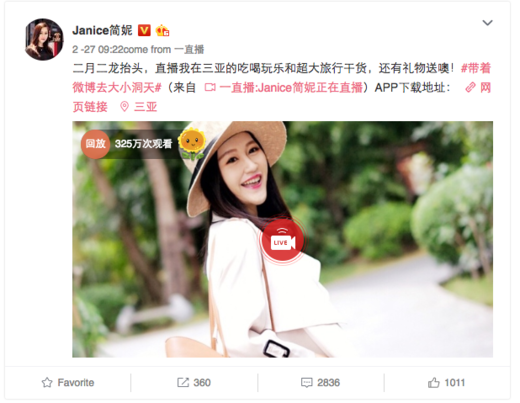 With more than 1.6 million Weibo fans, she’s constantly sharing her life and insider tips to things like having high tea in Macau, getting SPA experience in Sanya, or enjoying the best beaches around LA. By actively interacting with her fans, Janice helps to create tangible guides for future travelers. Travel KOLs are supposed to be experts, so brands should help them expand their expertise. This means providing exclusive insights into locations, trends, and services that travelers will find valuable. As a travel company, you know a lot more about unique, out-of-the-way or emerging itineraries than the average person. These kinds of trip ideas are especially alluring for people browsing the web for their next destination, as Airbnb well knew when creating their Experiences feature and Wanderlust campaign. Airbnb used their hosts’ plethora of local knowledge to create unique experiences. Be your China KOL’s well of exclusive local info. People start following a KOL because they provide unique value and perspectives. For most travel-focused China KOLs, unshared information to create something valuable in their niche is worth much more than discounts or merchandise. Provide the KOL with exclusive images and videos that are worth posting. This strategy is especially useful if the KOL will not be traveling. Give him or her as much support as you would an in-house employee to produce content. After all, they are taking the role of an employee. 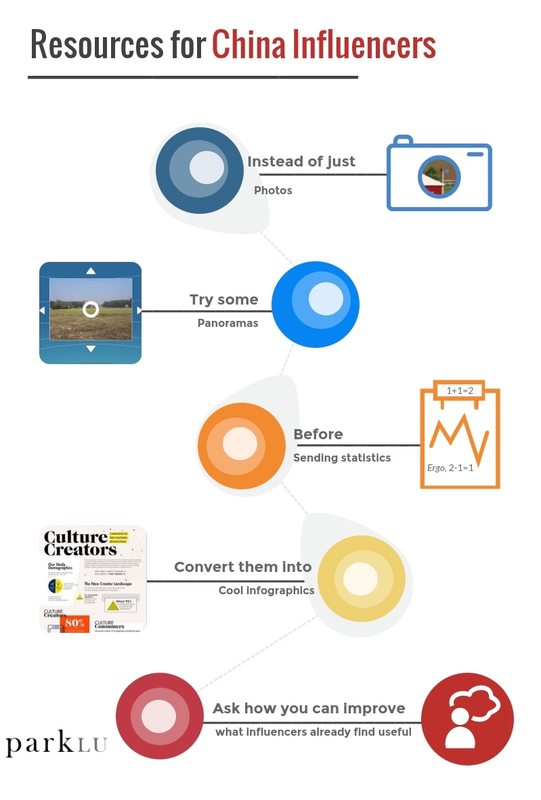 If you don’t hire a KOL, you will pay someone to do creative, do distribution, and make targeted ads. A KOL does the work of an entire marketing department. You, however, — as a travel company with on-location staff or at least a network in the destination area — have the raw materials and vicinity to make great content. Finally, give-aways do have their place — but here’s an alternative method. Rather than giving the KOL a product, give her something she can give to fans in her own give-away. Chinese followers love give-aways. It’s fun, makes them feel valued, and can create additional promotional materials. But don’t make it a broad discount give-away, make it exclusive, and make it exciting.